For the twelve-month period ending December 31, 2018 the BISX All-Share Index closed at 2,109.45. This represents a year to date increase of 45.88 or 2.22%. By comparison for the twelve-month period ending December 29, 2017 the BISX All-Share Index closed at 2,063.57. That increase was a year to date increase of 125.36 or 6.47%. The BISX All-Share Index is a market capitalization weighted index comprised of all primary market listings excluding debt securities. 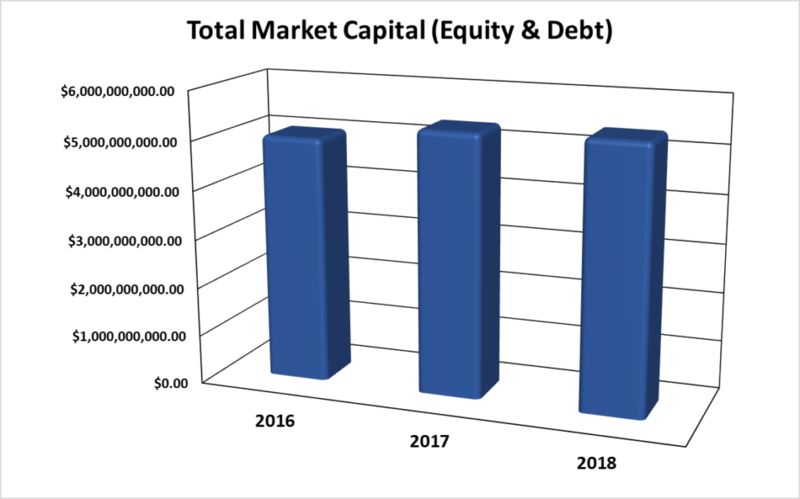 As at December 31, 2018 the market was comprised of 19 ordinary shares with a market capitalization of $4.48 Billion. In addition, there were 13 preference shares with a market capitalization of $327 Million and 19 bonds with a face value of $579 Million. For the twelve-month period ending December 31, 2018, each type of security produced the totals in the chart below. Trading volume for the twelve-month period January 2, 2018 to December 31, 2018 was 8,519,711 shares for a value of $ 41,832,862.36. Trading volume for the twelve-month period January 1, 2017 to December 29, 2017 was 5,128,595 shares for a value of $44,596,767. Trading volume for the three-month period October 1 to December 31, 2018 was 1,308,443 shares for a value of $ 6,352,247.50. By comparison, for the three-month period from October 1 to December 29, 2017 was 1,714,335 shares for a value of $8,151,746. shares which resulted in an average daily trading value of $167,596.14. 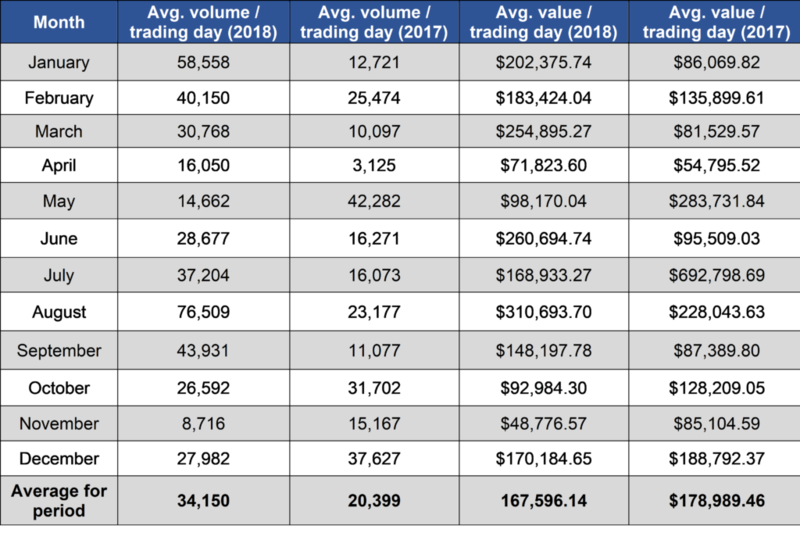 By comparison for the twelve-month period December 29, 2017 the average daily trading volume was 20,399 shares for an average value of $178,989.46. 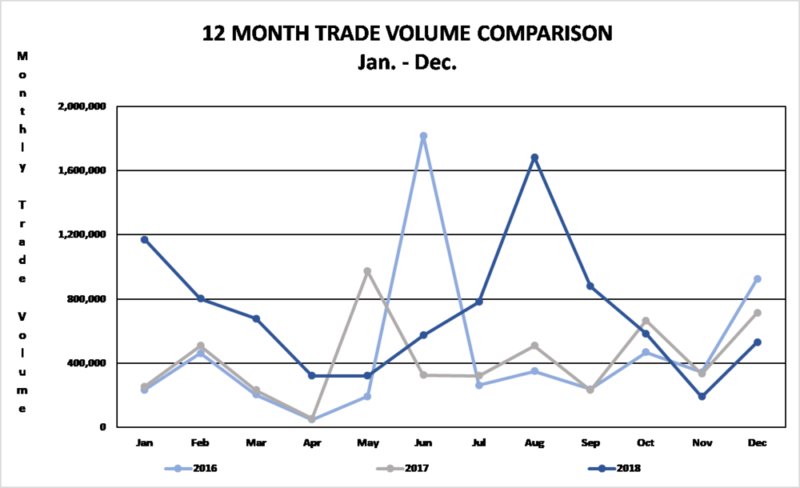 During the three-month period from October 1, 2018 to December 31, 2018, the average volume per trading day was 21,097 shares for a value of $103,981.84. 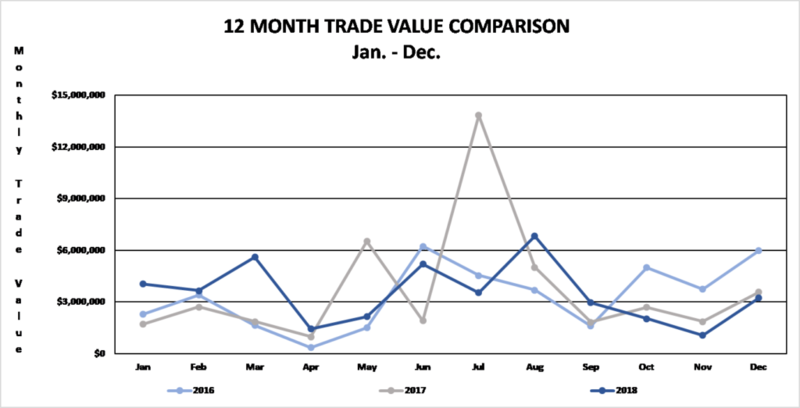 By comparison, for the three-month period from October 1, 2017 to December 29, 2017, the average volume per trading day was 28,165 shares for an average value of $134,035.34. 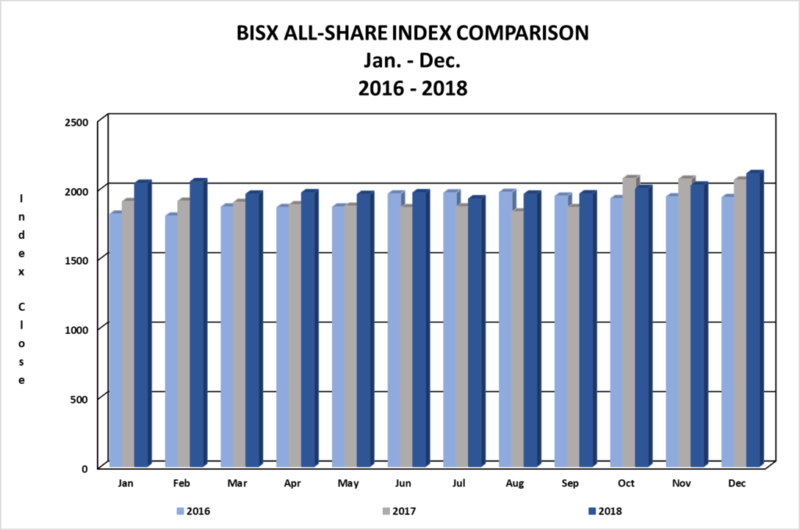 BISX is pleased to announce its BISX All-Share Index and trading statistics for the nine-month period ending September 28, 2018 with comparison to the same period of 2017. 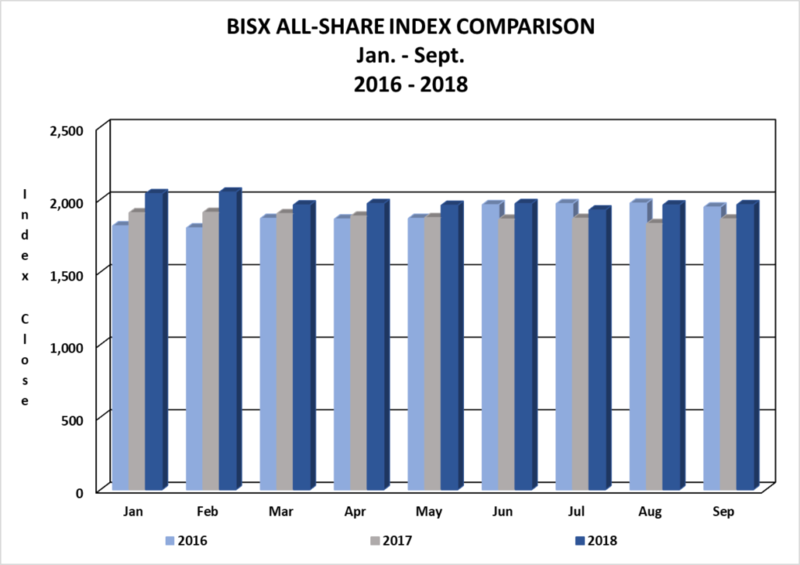 For the nine-month period ending September 28, 2018 the BISX All-Share Index closed at 1,964.04 this represented a year to date decrease of 99.53 or 4.82%. By comparison for the nine-month period ending September 29, 2017 the BISX All-Share Index closed at 1,865.88 this represented a year to date decrease of 72.33 or 3.73%. The BISX All-Share Index is a market capitalization weighted index comprised of all primary market listings excluding debt securities. 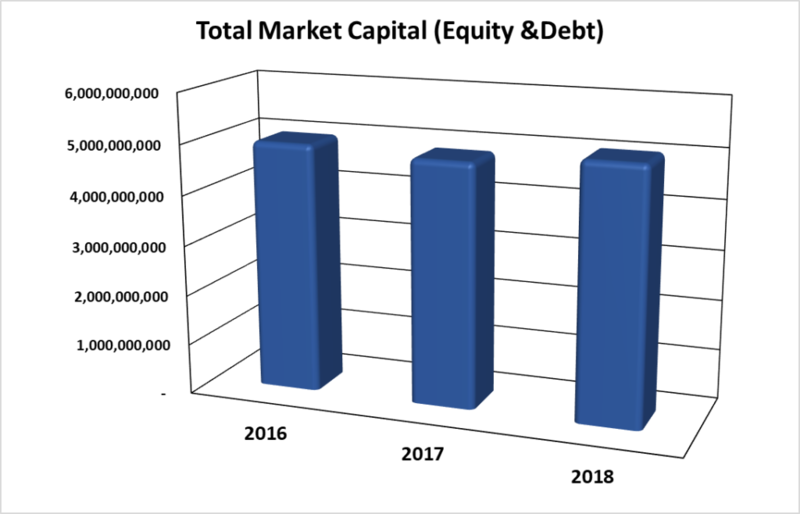 As at September 28, 2018 the market was comprised of 19 ordinary shares with a market capitalization of $4.144 Billion. In addition, there were 13 preference shares with a market capitalization of $327 Million and 19 bonds with a face value of $579 Million. 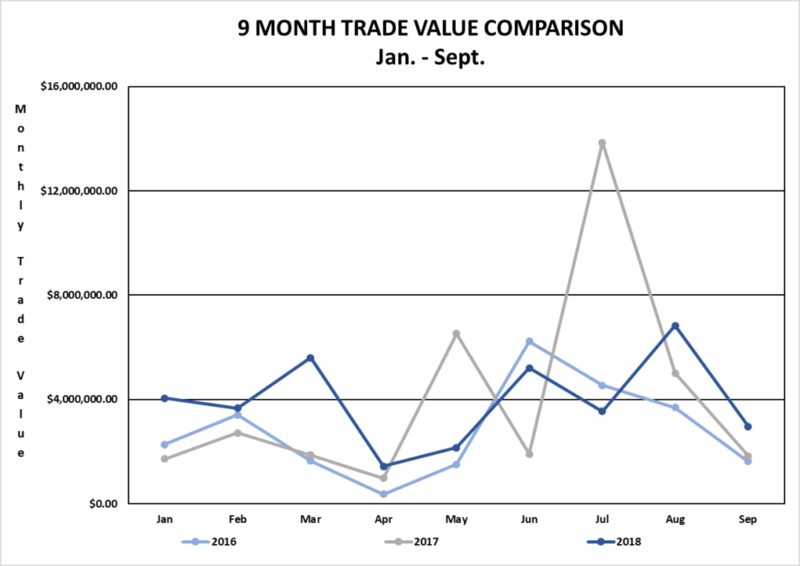 For the nine-month period ending September 28, 2018, each type of security produced the totals in the chart below. Trading volume for the nine-month period January 2, 2018 to September 28, 2018 was 7,211,268 shares for a value of $35,480,614.86. By comparison, trading volume for the nine-month period January 1, 2017 to September 29, 2017 was 3,414,260 shares for a value of $36,445,020.43. Trading volume for the three-month period July 1, 2018 to September 28, 2018 was 3,343,087 shares for a value of $13,346,815.61. By comparison, trading volume for the three-month period July 1, 2017 to September 29, 2017 was 1,063,957 shares for a value of $20,708,119.53. 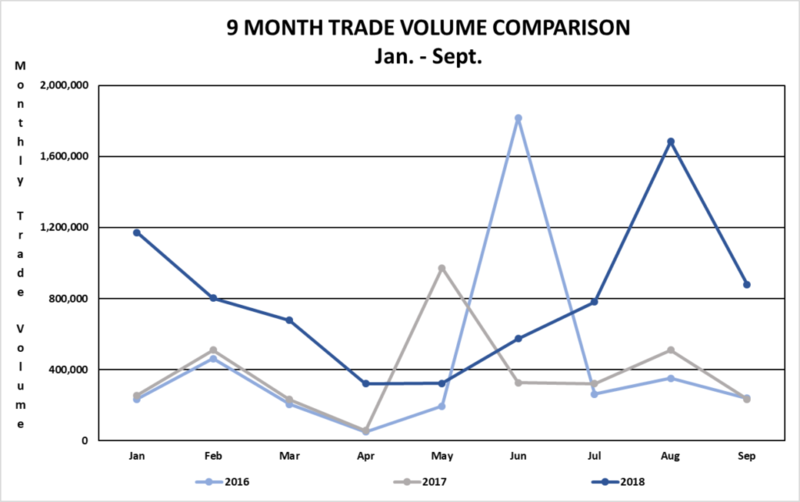 For the nine-month period from January 2, 2018 to September 28, 2018, the average volume per trading day was 38,501 shares for a value of $188,800.91. 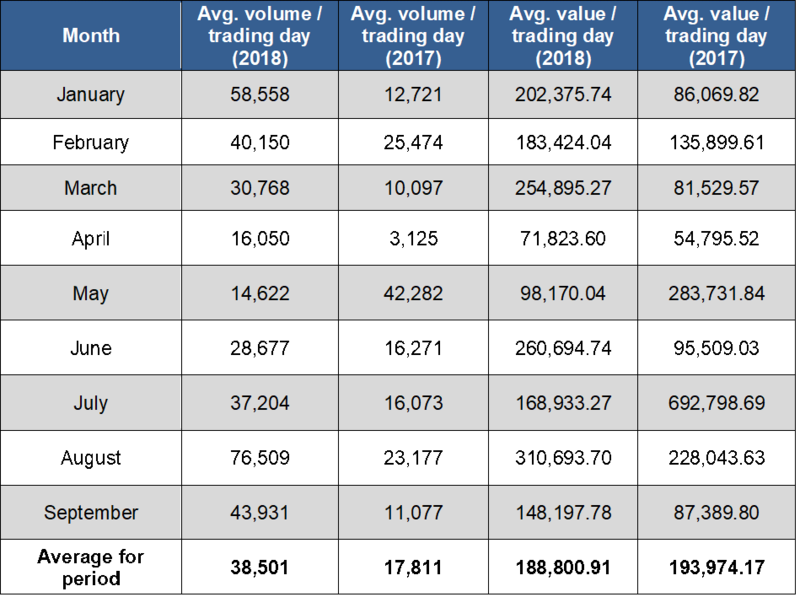 By comparison, for the nine-month period from January 1, 2017 to September 29, 2017, the average volume per trading day was 17,811 shares for an average value of $193,974.17.